In an emergency situation, it's critical to have fast, easy access to contact information for emergency services and individuals who may be able to help. An important part of making sure that your family is prepared for emergencies is to have all the important phone numbers you may need in an emergency already printed up beforehand. 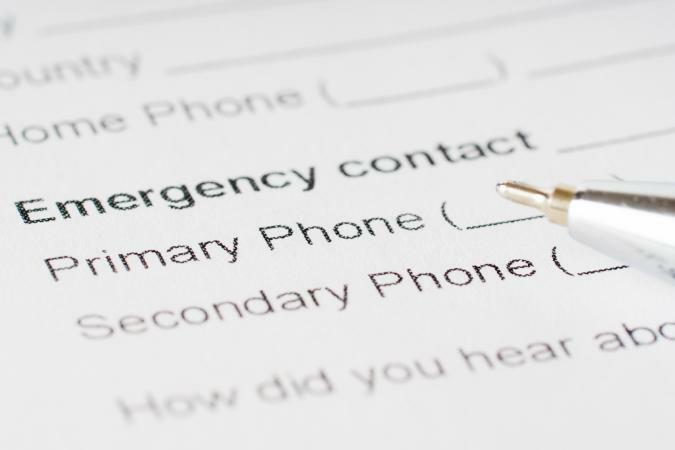 Putting together a comprehensive emergency phone list is a great way to do just that. Download the customizable template provided here and fill in your information. 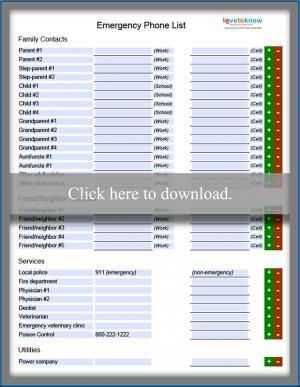 If you're ready to prepare your own emergency phone list as part of your home safety plan, simply click the image to access a PDF file that can be edited, customized, saved and printed. Once you click the image, the document will open as a PDF file. Save the file to your computer or other storage device by clicking the diskette icon on the tool bar. Be sure to use a file name that will make it easy to locate when you need to update the information. Fill in all applicable names and phone numbers, being sure to include area code. Simply click in the cell where you want to enter data and begin typing. You can navigate from one cell to the next using the tab key, or by pointing with your cursor and clicking. If some of the line items on the list don't apply to you, click the minus sign (-) at the end of the row to remove it. If you would like to add additional contact resources, click the plus (+) sign at the end of the row above where you would like a new line to be inserted. When you have finished, save the file by clicking the diskette icon on the tool bar. Print one or more copies to keep on hand in your household. Keep the list in a central location and make sure everyone in your home knows where it is. If you have kids and leave them with a babysitter, be sure that the sitter is aware of the list and its location. It's also a good idea to have each family member keep a copy of the list somewhere they can access it easily, even when not at home. You may want to have your kids keep a copy in their book bag, for example. Adults can keep a copy in their purse or briefcase, or in the glove box of each vehicle. The key is to ensure that you - and everyone in your family - have easy access to get in touch with people who can help in an emergency situation. You might never need the list at all, but it's certainly best to be prepared in case the need arises.